bachaddict wrote: Why am I getting deja vu reading the comic? I feel like I've seen one of the concepts before, like time travel or something. I have definitely read or heard this text before, and I can't remember where. It's driving me sufficiently nuts that I dusted off this forum account in the hopes of someone putting me out of my misery. I'm guessing that Randall found an old note with the comic idea and forgot that he'd already used it. mikrit wrote: Aren't there plenty more dimensions in dimensional analysis, like luminosity per mass-length and whatnot? But maybe they only have the name (that is: the family name, Dimension) in common with the four that became famous. I tried to understand why dimensional analysis works, once. Didn't succeed, though. PS: remarkable memory you got there, ggh. The first time I ran into dimensional analysis I was amazed that worked as well as it did. Of course, you need to be sure you have included all the possibly relevant parameters. That can sometimes be tricky. If you're looking to derive the formula for how long it takes water to empty from a container with a hole in the bottom (my first attempt) that's pretty easy to do. But I'm not sure it would be of much value for a truly non-trivial question. And either way, then you've got to run an actual experiment to measure the proportionality constant. [EDIT: Just realized I never answered the question.] I'm pretty sure dimensional analysis works because it's based on the definitions built into SI, and that's a rigorously crafted and internally consistent system. Dimensional analysis can prove that a formula is wrong - or at least incomplete - by showing that the dimensions are inconsistent. If you have a pretty good idea roughly what the formula should be then eliminating a lot of wrong possibilities leaves you with relatively few candidates for the right answer. Envelope Generator wrote: May I ask you if you've considered all the possibilities that "down" might offer you? What I find weird about dimensional analysis is that one is allowed to multiply apples and oranges to get appleoranges, or divide them to get apples per orange, but never ever add them. Why is multiplication more flexible than addition? And am I allowed to raise an apple to the orangeth power? Back to four famous dimensions: in my country there is a rhyme to tell your fortune by noting from which direction you hear the cuckoo. West cuckoo is best cuckoo. (It rhymes better in Swedish). At the current state of the art in fortune telling, it is unknown what it means to hear a cuckoo from above, below, the past, or the future. mikrit wrote: What I find weird about dimensional analysis is that one is allowed to multiply apples and oranges to get appleoranges, or divide them to get apples per orange, but never ever add them. Why is multiplication more flexible than addition? And am I allowed to raise an apple to the orangeth power? Maybe I'm not following here. Let's take two dimensions of space. Now we'll divide them by time. We now have area per unit time, which I can use to mow my lawn. What would subtracting mass from this expression even mean, and how does it help me mow my lawn? It could mean, for example, that there is a theory that postulates that the peak performance of an ideal lawnmower is directly proportional to its mass. It is just that I feel somehow that I understand dimensional analysis only halfway, and that there is some further level of understanding that is possible to achieve, if I had the right insight. But I can't explain very well what I feel is missing. That's not very sensible, I suppose. Nothing to see here, move along (in a timelike or spacelike direction). Kit. wrote: It could mean, for example, that there is a theory that postulates that the peak performance of an ideal lawnmower is directly proportional to its mass. Such a theory would involve a constant of proportionality, which would have dimensions of area per unit time per unit mass. One idea that might help is that units are fundamentally multiplicative. When you say "2m" you really are multiplying the dimensionless number 2 by the unit "metre". 4m is twice 2m, i.e. 2x2xm. 4m2 is 2m x 2m = 2 x 2 x m x m. We don't normally write the times sign in there, but it's in there implicitly. Similarly, you sometimes see plots in which some quantity is divided by a unit to give a dimensionless number to plot on the axis: for example you might see an axis labelled "height/m". If you start adding quantities that have different units, you have something like 2m+2kg; we tend to say that this simply isn't meaningful, but it's more the case that it's not particularly useful because those two terms will remain forever separate. It could still be useful: you might have 2m of licorice and 2kg of chocolate: if there are 10 of you you each have (2m+2kg)/10=20cm+200g. But note how careful you have to be to keep the units as a multiplicative factor in their respective terms. On the other hand, if the units have the same dimensions, you can work with them: if I have 2m+6in, I can note that in=0.0254m, so I have 2m+6x0.0254m=2.1524m. Note how the normal rules of multiplication apply. Also, just because things have the same units or dimensions doesn't mean that adding them up is meaningful. Having 2kg of chocolate and 2kg of sand is different to having 4kg of gold; if you want to know whether you're over your baggage allowance it's ok to add, but if you want to know what it's worth at today's prices, you need to factor in the price per unit mass before you add. In terms of raising to a power, my hunch is that it's unlikely that you could ever have a meaningful formula in which the exponent had dimensions, but I'll need to think about it further! Last edited by orthogon on Thu May 14, 2015 5:17 pm UTC, edited 1 time in total. The constant of proportionality (which, frankly, is no different in its idea from the constants we use to convert Gaussian electromagnetic units to SI ones, and just slightly different from those constants we use to convert imperial units to metric ones). It would also allow us to measure lawn areas in such convenient units as mower-pound-minutes, like now we can measure interstellar distances in light-years. orthogon wrote: Also, just because things have the same units or dimensions doesn't mean that adding them up is meaningful. Having 2kg of chocolate and 2kg of sand is different to having 4kg of gold; if you want to know whether your over your baggage allowance it's ok to add, but if you want to know what it's worth at today's prices, you need to factor in the price per unit mass before you add. I would argue that kg(chocolate) and kg(sand) are different units. In the case of baggage allowance, they happen to be equivalent. What is "down" in terms of dimensions? Toward the enemy's gate, of course. Heimhenge wrote: [EDIT: Just realized I never answered the question.] I'm pretty sure dimensional analysis works because it's based on the definitions built into SI, and that's a rigorously crafted and internally consistent system. It's convenient that SI has a lot of conversion factors equal to 1, but in principle dimensional analysis doesn't require any particular set of units. niauropsaka wrote: Do other dimensions even have names? 19and to know the love of Christ which surpasses knowledge, that you may be filled with all the fulness of God. That is, God can give us the insight to see the fourth directional dimension. Edwin A. Abbott wrote: I. Space, my Lord, is height and breadth indefinitely prolonged. Stranger. Exactly: you see you do not even know what Space is. You think it is of Two Dimensions only; but I have come to announce to you a Third - height, breadth, and length. So, another naming convention would be breadth, length, height, and thickness. Last edited by mathmannix on Thu May 14, 2015 1:08 pm UTC, edited 3 times in total. Several years ago I tried "inventing" a variant on noughts-and-crosses, played in four dimensions. From (hazy) memory it had a 3x3 grid of the usual 3x3 grid, so "lines" could be completed horizontally, vertically or diagonally on a single grid, by using the same cell position in grids in a horizontal, vertical or diagonal line, or (I think) a combination of both. So if putting a cross in the centre cell of the grids in the top row could be considered analogous to completing a "vertical" line, it follows that putting a cross in the centre cell of the grids in the left column would be a fourth dimension. I tried running it past a friend. "But the fourth dimension is time!" "No, in this particular game there are four dimensions, drawn in 2D". "Popularly, yes. But in the context of this game I'm using four directional dimensions, to make it more interesting". I gave up on the concept. 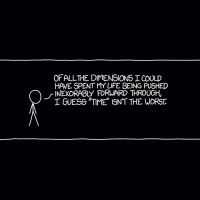 Although calling time the fourth dimension is popular, it's more sensible IMHO to call it the zeroth dimension. Then it doesn't get in the way when you want to do stuff in systems with more than 3 spatial dimensions. FWIW, this is the usual convention in relativity; see Four-vector. But to get back to higher-dimensional noughts-and-crosses (or tic-tac-toe for our American friends), it can be fun, but as rmsgrey points out it's a trivial win for the first player in dimensions > 2 on an order 3 board. However, the order 4 game isn't too bad in 3 or 4 dimensions. I introduced the 4x4x4x4 game to my classmates in high school, using a similar layout to yours - a 4x4 grid of 4x4 grids, and it became quite popular for a while. For more fun, try "wild" noughts-and-crosses: both players can play either a nought or a cross on each of their turns, the winner being the first person to make a complete line of either symbol. Another variant is misère noughts-and-crosses (aka reverse noughts-and-crosses, or toe-tac-tic): the first person to make a complete line of their symbol loses. And of course, to really get your brain going, you can combine both of those variants. Weird as it might sound, wild misère noughts-and-crosses seems more natural than either variant on its own. You can play those variants on a standard 2D 3x3 grid, but you have to adopt the additional rule that the centre square is out of bounds on the first move; such restrictions aren't required for games on order 4 boards. Oh yes. "Tic-tac-toe" was what we used to call "rock-paper-scissors": we'd chant those three syllables as we shook our fists, with "toe" coinciding with the instant at which the weapon was revealed. Anyone else? Or was that a hyper-local thing? ETA: why is noughts-and-crosses called tic-tac-toe, anyway? But height and depth are not different dimensions. They go along the same axis, just in opposite directions. mathmannix wrote: So, another naming convention would be breadth, length, height, and thickness. And "thickness" is also not a distinct dimension, but rather something you could use to describe the thinnest of the other three. orthogon wrote: ETA: why is noughts-and-crosses called tic-tac-toe, anyway? orthogon wrote: One idea that might help is that units are fundamentally multiplicative. When you say "2m" you really are multiplying the dimensionless number 2 by the unit "metre". Wikipedia wrote: "Tic-tac-toe" may also derive from "tick-tack", the name of an old version of backgammon first described in 1558. The U.S. renaming of Noughts and crosses as Tic-tac-toe occurred in the 20th century. But that theory raises the questions why you would name noughts-and-crosses after backgammon, and why backgammon would be called tick-tack. Personally, I always thought the three syllables represented the three movable pieces that each player has got (in that version of the game). Is that Three men's morris? And chess ought to be called "White king, white queen, white bishop, other white bishop...". For those of you who don't like the distinction between space-like and time-like dimensions, I recommend the Orthogonal Trilogy by Greg Egan, which takes place in a universe with only space-like dimensions. All the physics (and the odd results) are worked out in great detail, plus it's a good story. I work in 3 CAD packages which are all from the same supplier, each handling XYZ differently. In one, for 2D drawing, XY is a flat plane, normally implying the ground plane with Z elevation above it (ie parallel to gravity) - alternately for "elevation" drawings, X is horizontal and Y vertical. The two for 3D drawing make it complicated, one assumes XY is ground with Z elevation, the other insists XY is a vertical plane (X horizontal, Y vertical) with Z being towards the viewer or away. It gets rather confusing when switching between the two. area wrote: I have definitely read or heard this text before, and I can't remember where. It's driving me sufficiently nuts that I dusted off this forum account in the hopes of someone putting me out of my misery. I've seen this exact text before in a deleted 2012 tweet by BeeStapler. I can't post links here yet, but there's bit more info on this comic's reddit thread in /r/xkcd. Yeah, that's still weirding me out. Tweet copied verbatim and it's strangely deleted. Maybe BeeStapler is Randall in disguise? He tweeted a joke about terrible Boston roads earlier. I'm tempted to follow BeeStapler now, except that my follow count is 1337 and their follower count is 1337, so it would ruin it for both of us. duckshirt wrote: Maybe BeeStapler is Randall in disguise? That would be my guess, honestly. Unless you're talking about depth as in depth perception, then it's used to measure the distance along your line of sight. The Moomin wrote: During my maths degree, one of the tutors mentioned "the nth dimension of porridge". I can't decide whether being pushed through porridge would be soothing or horrific. I think it would be too hot or too cold. Multiplication allows you to create an area (orthogonal), adding allows you to go ahead (straight). If you have 20 applesoranges and want to divide it among two apples, each one has a share of 10 oranges. If you have 20 manhours of work and two men, each one has to do 10 hours of work. But... there's already a twit, @xkcd, "Randall Munroe", with 23.8K followers. Which has apparently never tweeted? Would he have a second one? Is that allowed? You can have as many Twitter accounts as you have email addresses. He might well want somewhere where he can tweet things without legions of xkcd fans critiquing them or judging them differently because he's the Great Lord Randall. One other of his that's public knowledge is @whatifnumbers or something like that, where for a while he posted random interesting numerical facts he came across while researching the what-if articles. Yes but is it meaningful to Wait for it? Some might claim that you would get farther being Taken rather than Left. Anyway it's best to go left, unless you want london to turn into a nuclear wasteland and great britain to turn into a labour camp. People do that all the time, for everything from buses to lovers to deities. Many things that have Left will come back again. So... a dimension that comes back on itself? Left is one of the little curled-up ones, then? No, it just turns out that at high enough energy, left and back unify to a single dimension. A curled-up dimension seems useful. If I had to pick a direction other than the future to be inexorably pushed in, I'd switch to spherical coordinates and pick the azimuthal angular coordinate. That way I'd just spin or go in circles. Assuming I retain control over the radial, polar coordinates it seems I could go pretty much anywhere (though not choose which way I'd look) and with some control over the temporal coordinate also stay for a while or return soon enough. Is the stretch from dimensions to coordinates cheating? Are Cartesian coordinates more fundamental than spherical? Are angular coordinates space-like although they are not lengths?